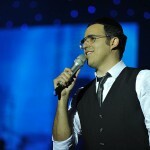 One of Jewish music’s brightest stars took to the stage this past Tuesday in an effort to express his gratitude to Israeli soldiers in a record breaking concert held at Tel Aviv’s Nokia Arena. Over 8,000 people were in attendance for an evening of music with Yaakov Shwekey, among them 2,000 invited guests, all members of Tzahal. “As a singer, what can you possibly do to thank the soldiers who put their lives on the line every day?” asked Shwekey in an interview with VIN News. It took over two days to build the set for the massive concert, entitled Shir Lachayalim, which featured an unprecedented160 musicians of all ages. Among those who joined Shwekey onstage were Lieutenant Colonel Shaya Abramson, chief chazan of the Israeli army, fourteen year old child phenomenon Michel Cohen, winner of the inaugural season of Israel’s Beit Sefer L’Musica, popular Israeli singer Shlomi Shabat and Metalish. In addition to performing many of his well known hits, Shwekey also sang two new songs that were written for the evening, one a hora called Lo Yisa Goy and the other entitled Misheberach, with lyrics from the weekly tefila said in many locations on behalf of the Israeli army. While the overall theme of the night was thanking the chayalim for their efforts, unity between Jews from all over the spectrum was also a major part of the event.